The skin has an outer protective layer known as keratin. The thickening of this outer layer is what is referred to as hyperkeratosis. This thickening of the skin’s outer layer is usually a measure to protect itself from rubbing, scratching, and other forms of irritation on the skin surface that cause corns and calluses especially in the hands and feet. These are small bumps on the skin’s surface caused by the human papillomavirus (HPV). Other types of warts known as plantar warts develop onto the soles of the feet. Usually, HPV is transmitted through contact typically by touching or shaking hands with an infected person. It can also be transmitted by touching a contaminated surface such as a gym floor or a pool deck. Corns and calluses develop only after repeated friction and pressure that results in the formation dead cells on the skin’s surface. Corns appear on irritated toes whereas calluses develop on palms of the hands and soles of the feet. For most o the patients, corns, and calluses are just a form of the cosmetic nuisance, but to others, it is a disturbing and painful experience that requires medical attention. Also known as dermatitis, eczema is the inflammation of the skin due to allergies and irritating chemicals. The condition is characterized by redness, tiny blisters, and a continuous itching effect on the skin. When inflammation becomes difficult to manage, the following symptoms are visible. Lichen planus: This condition can be related to an abnormal reaction of the immune system. It is mainly characterized by a lacy white patch that appears inside the mouth or elsewhere on the skin to cause and itching effect. Seborrheic keratoses: These are noncancerous growths that appear in different colors ranging from black, tan, and brown. They are often visible on the face, arms, trunk, or legs. This condition is very common, but its cause has remained a mystery. Inherited conditions: Several inherited traits can cause hyperkeratosis that is characterized by widespread, thick scaly patches on the skin. These symptoms start to show immediately after birth or during early childhood. Many forms of this condition do not exhibit any signs and are completely painless. However, the presence of corns, calluses, and warts signifies lots of discomfort. With follicular hyperkeratosis, it presents with features like excessive development of hair follicles and keratin that result in rough, elevated papules that are cone-shaped. The papules are clogged with some white plug made up of encrusted sebum. This is a skin disorder that is congenital, implying that it occurs at birth. It’s also referred to as bullous ichthyosiform erythroderma and is an odd skin disorder that falls under ichthyosis. An affected baby may have reddened skin or erythroderma and pretty severe blisters. Usually, babies having the disorder miss the protection offered by normal skin, and it means they are at risk of getting dehydrated and suffering from skin infections or infections on the other parts of body, something known as sepsis. The blisters tend to be less frequent as the person gets order. Also, erythroderma or reddened skin becomes less evident. With age, the skin becomes more thicker something known as hyperkeratotic and this is seen over joints, and parts of skin that get in contact with each other. The thick skin may form on neck or scalp and it’s usually darker compared to the normal color. It is likely that bacteria will grow on the individual’s affected or thick skin and begin to cause odor. There are two types of epidermolytic hyperkeratosis, PS-type and NPS-type. 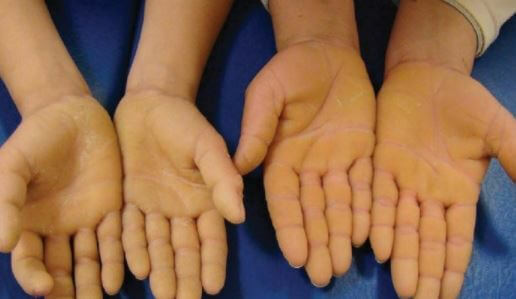 The former presents with thickened skin on a person’s palms and soles (palm hyperkeratosis and sole hyperkeratosis, respectively.) Palm hyperkeratosis may also be referred to as palmoplantar. The PS-type also affects other parts of an individual’s body. Canine hyperkeratosis involves the thickening and hardening of the dog’s paws and nose skin. There is no cure for this disorder, however, there are ways you can prevent your canine from developing hyperkeratosis. The condition occurs because of the formation excess keratin. The types of the skin disorder in dogs are nasal hyperkeratosis that forms on the nose, and paws or food pad hyperkeratosis that develops on the paws of the dogs. In essence, the doctors can diagnose the condition using one’s medical history or visible symptoms on the skin such as warts, corns, and calluses. If the disease is allergy-related, an allergy test can be convenient to test for chronic eczema. In other instances, a biopsy, which entails the removal of a body tissue and examining it in the laboratory is carried out to test for the condition. If you doctor suspects the presence of actinic keratoses, a skin biopsy is necessary to confirm the presence of the disease as well as a rule out the development of skin cancer. If a child suffers from hyperkeratosis, the doctor will need to review the entire family to determine whether the condition has been inherited. The treatment method applied heavily depends on the cause. Constantly use a moleskin on areas surrounding the affected areas to decrease pain. Also, make sure always to put on the appropriate footwear to avoid further friction. Repeated treatments are sometimes necessary in case the treatment does not reach the targeted layer of the skin that is infected by the virus. The condition can also be treated using home remedies. However, the results are not as useful as when handled by a medical practitioner. It is advisable to adopt home treatment remedies only after treatment by a medical professional to enhance quick recovery. This applies in particular in the case where the warts are either broad or deep than normal. Patients with poor circulation or diabetes should be treated by doctors to avoid further infections or injuries. This condition is best treated by applying corticosteroid cream or ointment. Moisturizing the skin is another means of speeding the healing process. 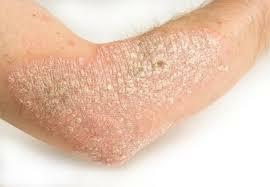 Just like chronic eczema, lichen planus is also treated by applying corticosteroid cream and ointment. For a single actinic keratosis, your doctor might prescribe cryosurgery. However, in a case of multiple keratoses, peeling of the skin through laser therapy and dermabrasion is the most appropriate method of treating hyperkeratosis. The condition is best treated with cryosurgery or using a scalpel. Corns and calluses can be conservatively dealt with by wearing comfortable shoes. Plantar warts can be avoided by ceasing from walking barefoot in pool areas, gyms, or locker rooms. Actinic keratoses can be controlled by limiting the extent to which you expose your body to sunlight. Applying sunscreen to exposed body parts as well as wearing protective clothing when going outdoors is also another way of avoiding the disorder. Most forms of these conditions have a good prognosis. However, actinic keratoses can develop complications such as squamous papilloma cell skin cancer. Freedberg, et al. (2003). Fitzpatrick’s Dermatology in General Medicine. (6th ed.). McGraw-Hill. ISBN 0-07-138076-0. synd/1036 at Who Named It? Cheng J, Syder AJ, Yu QC, Letai A, Paller AS, Fuchs E (September 1992). “The genetic basis of epidermolytic hyperkeratosis: a disorder of differentiation-specific epidermal keratin genes”. Cell. 70 (5): 811–9. doi:10.1016/0092-8674(92)90314-3. PMID 1381287. James, William; Berger, Timothy; Elston, Dirk (2005). Andrews’ Diseases of the Skin: Clinical Dermatology. (10th ed.). Saunders. ISBN 0-7216-2921-0. 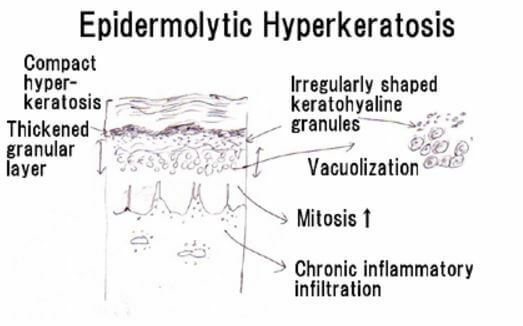 “What is epidermolytic hyperkeratosis?”. Retrieved 2011-11-03.